So it’s Mark Webber’s final F1 race this coming weekend. Such a shame that he’s leaving the sport but I can understand why he’s moving on to other things. He says that the team politics is not the main reason for leaving but I’m pretty sure it’s partly to blame. And quite understandably so. I mean I get annoyed with the favouritism towards Vettel and I’m not even pat of the team! 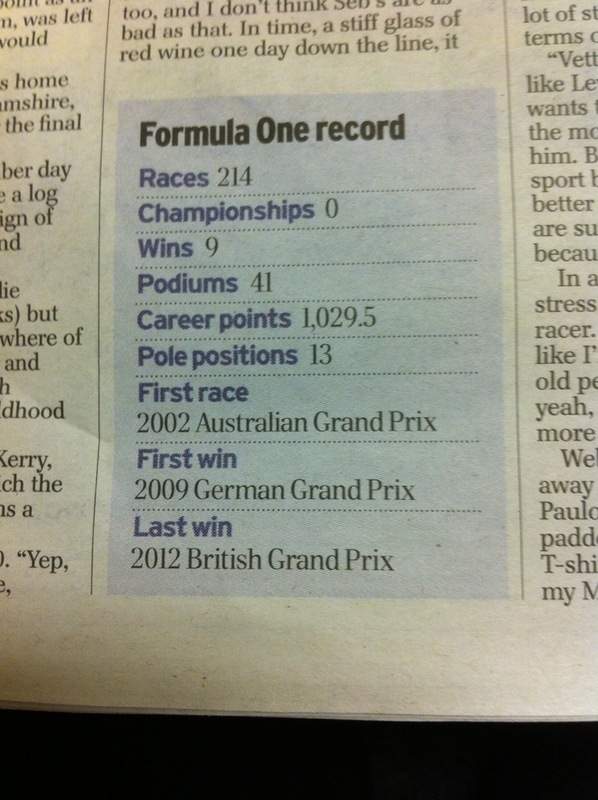 To celebrate his F1 career there was an article in the Daily Telegraph recently. I don’t read the Daily Telegraph but fair play one of my bosses kept it for me (as he knew how much I fancied Webber!!). It’s an interesting article but what I found fascinating was the career statistics. His last F1 race win was Silverstone 2012 – and I can proudly say I was there to see it!!! I said the year before that I wanted to see Webber win at Silverstone and thankfully I got the chance. And it was awesome! Really really was wonderful!